Maybe instead of naming the perch in an anvil, you could give the perch a GUI where you can name it. Then when you send the pigeon you could just type the name of the perch that you want to send it to. P.S. If this doesn't get into the game, please make a mod for it!! GENERATION 36: The first time you see this, copy it into your signature on any forum and add 1 to the generation. This is a Social experiment. It might be me being the idiot that I am but where is the download link? Pigeons wouldn't be useful at all. If you wanna send messages then just /msg or /whisper the guy you're messaging. Items dude is clear that you didnt read the thread completely. I love it! Everything about it is perfect and well thought-out! Full Support! So, how are the developers going to see this? If all you focused on in life was purposefulness, then what would be the purpose? Support our pigeons! !Click Here For The Thread! !Click Here For The Banner! The idea is well thought out, in my opinion. It's a neat-looking mob, none too gimmicky, and it's got a unique function that's hard to replicate, but definitely useful. My one question though, is what would determine who owns the perch? To my knowledge, Minecraft doesn't quite have an owner-of-block tag for any of it's placed blocks. Also, if the pigeon becomes the recipient's pigeon when they take the items, wouldn't that discourage sending it to other players? I'd think you'd lose a lot of pigeons that way. May have misunderstood that one, though. I think one idea, though, would be to tell a pigeon to fly to a given coordinate/chunk coordinate pair(X/Z coordinates), and deliver it to any perches in a certain area around that if it can find one. Just a suggestion. I apologize if anything in this post was already stated, or is wrong. Easy... Have you ever played Minecraft modded before? Take Tesseracts for example, they have a private and public state. When you write in Java, you can put security tag, it's really not that complicated. It's been on reddit for over a year now, with 2 different posts about it. There's been a link to the reddit right at the top of the thread for months now. Since I have made a new account, I will be remaking this thread on this account instead of my old Snowviraptor account. 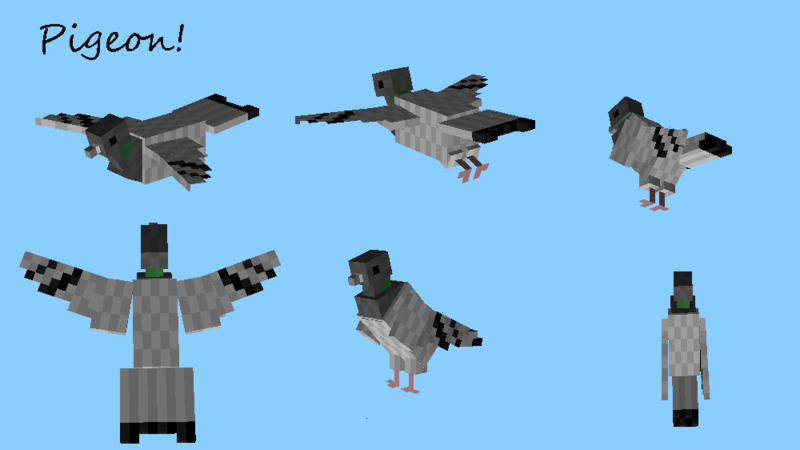 *New Pigeon model. I'm so much better at modelling now that I'm sure I can make something better. It might also fit in with what I call the Neo-Vanilla modelling style (Horses, Guardians) although I would have an alternate old style, for those like me who like that. *Refined concepts. I've had a few ideas for improvements that I have not got around to posting. *Tidier thread. This thread, imo, is very messy. I'm going to format it, and remove some of the unneeded parts. I'll be sure to edit this thread to make it link to the new one before getting it locked. Coming soon to a Minecraft Forums Suggestion section near you! Now that there is a new thread, this thread can be locked, but keep it visible so people can be redirected to the new page. The suggestions page now lists this thread as having 500 replies, so yay!